Ft Worth Texas based Within Chaos is bringing the energy back out on the “Road to Retribution Tour” their first North American tour since 2009. The band recently wrapped up recording a new 5 song EP “FAREWELL THE FORGOTTEN ONES” This will be a limited edition EP and will only be available at the upcoming shows. You can listen to one of the new tracks here. 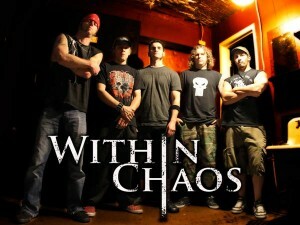 Joining Within Chaos on the tour will be fellow Texans Silence The Messenger. Commented bassist Jim Taylor: “We are really excited to get back out on the road it’s been way to long since our last tour! We have always been a band that prides ourselves on our live show. It’s been awhile hopefully our fans haven’t forgotten about us. As promised, we are coming back to destroy them”.